The former RTÉ journalist and founder of Storyful has his eye on the ‘broken’ media model. AFTER LEAVING TWO high-profile positions in the space of two years, Mark Little has no intention of taking on another job soon – he’s ready to start something of his own. The former RTÉ journalist went to work with Twitter after leaving Storyful, the social media news agency he founded in 2009 and sold to Rupert Murdoch’s News Corp in late 2013. 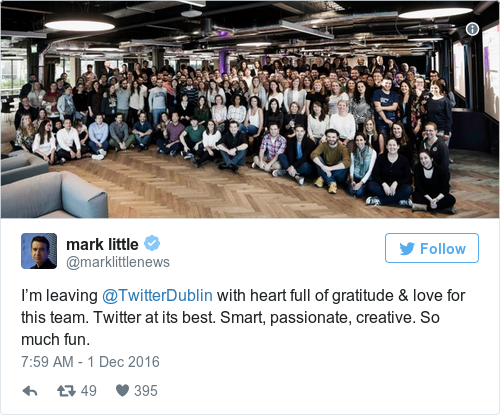 Little was initially appointed the social network’s vice-president of media partnerships in Europe, before being elevated to head of Twitter’s Irish operations – a position vacated by Stephen McIntyre. However, within six months it was announced he was leaving. Contrary to what the quick departure may suggest, Little says there is no ill-feeling involved in his separation from the company. “Everyone wants me to hear me dishing dirt, but I have nothing but love for the Twitter team – in Dublin particularly – and also for Twitter itself,” he tells Fora at this week’s FutureScope conference. Nevertheless, he says it wasn’t in his best interest to continue at the company after it shifted its key leadership roles back to the US. “I wish it had turned out slightly differently, but the problem was basically the team I was running on the media side needed to be brought back and centralised in the US. Since he left Twitter, Little says he has fielded several job offers – including media and advisory roles, and investment opportunities in the startup sector. But the 49-year-old has no intention of taking on a venture capitalist or investor role – “it’s a particular skill set and you have to kiss a lot of frogs”. Rather, Little says he is doing something he didn’t do when he emerged from Storyful, which is to “take some time”. When it comes to his next idea, Little is certain of one thing – that he doesn’t know definitively what it will be yet. He adds that his role at Twitter reminded him that he loved working in news. Little is adamant that the model for news and information distribution is “broken”, and that the industry has become too dependent on social media platforms to get their word out there. He adds that news brands’ dependency on advertising for revenue is also something journalism needs to move beyond. “I think the old idea of banner and programmatic advertising and the manipulation of data – because essentially human beings are being harvested now, we are the product – that’s got to end. “Periodically there has been rebellions against advertising since it was invented back in the 19th century on a mass-market level, and periodically it goes too far. It has gone too far now. While questioning journalism’s reliance on advertising is easy to do from the pundit’s chair, coming up with a solution is harder. Little says he doesn’t have the perfect answer, but he adds that there are media firms – such as Irish podcast network Second Captains – bucking the trend and showing that companies don’t need to be reliant on advertisers to pay the bills. “Second Captains is a great example. Here we are, an independent media brand that’s building itself on the basis of a crowdfunding platform Patreon, that’s doing events, that’s getting – in business jargon – average revenue per user, which is the key. “I’m really excited to see people do that – to forget about advertising. We can build businesses about direct engagement with the individual user on the basis of their need.